Leadership at American companies have known for years about the shifting demographic tides in our country, but many of the most successful organizations continue to conduct business as they’ve done in the past. Corporate leadership with short-term earnings pressure are often hesitant to make any drastic changes when business is doing well. However, ignoring America’s rapidly shifting demographic makeup is not a sustainable business practice, and the leaders who do not act will pay the price sooner rather than later. Hiring more diverse candidates for your workforce has been proven to grow revenue and improve corporate culture, but it can also save your company a great deal of embarrassment and bad publicity when it comes to social media marketing. Brands with a significant social media presence put themselves at risk every time they send a tweet, post a picture on Instagram, publish a blog post, or even publicly communicate with the marketplace. In the past few years we have seen countless examples of corporate social media posts that are insensitive, offensive, or completely out of touch with growing demographic groups. The skin and body care brand Nivea recently gave us two glaring examples of social media marketing that ended up exposing them as out of touch with multiculturalism in the modern age. In 2011, Nivea launched a “Re-Civilize Yourself” campaign, which featured a clean-shaven black man discarding a costume mask of a black man with an Afro. 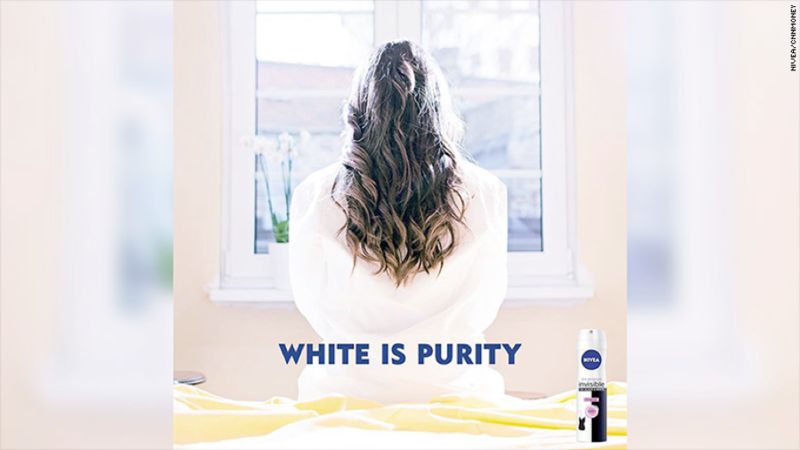 Just this past year Nivea launched another ad campaign, this one called “White is Purity” featuring a photo of a white woman in a robe gazing out her window. It’s possible and even likely that Nivea’s marketing team was unaware of the negative historical connotations between natural African-American hair and civility, as well as those between associating whiteness with “purity”. These types of “blind spots” are far more likely to be avoided when you foster a diverse workplace culture that allows collaboration between people with different backgrounds and perspectives. Nivea of course pulled the ads and publicly apologized in both instances, but the damage was already done. When a company publicly does something so culturally insensitive, it tends to go viral – especially amongst the communities who take offense. It is difficult to quantify the lasting damage something like this can do to your brand, and it could take years for a market segment to “forgive and forget”. This reality underscores the importance for creating a recruiting pipeline for diverse and multicultural candidates, and maintaining a workforce that is reflective of the changing marketplace you hope to serve.